If you follow me on Instagram @becky_wren you’ll have seen way back in June I visited the new CyroLabs in Poole, Dorset. After a recommendation from one of my Dad’s friends, myself & my Dad decided to give cryotherapy a try. I was recovering from a fractured arm & my Dad had a few aches & pains – mainly from the horses! Before I went into the chamber which gets as cold as -160C I couldn’t touch my shoulder with my hand, but after the session, my mobility had hugely improved & my physio was really impressed. 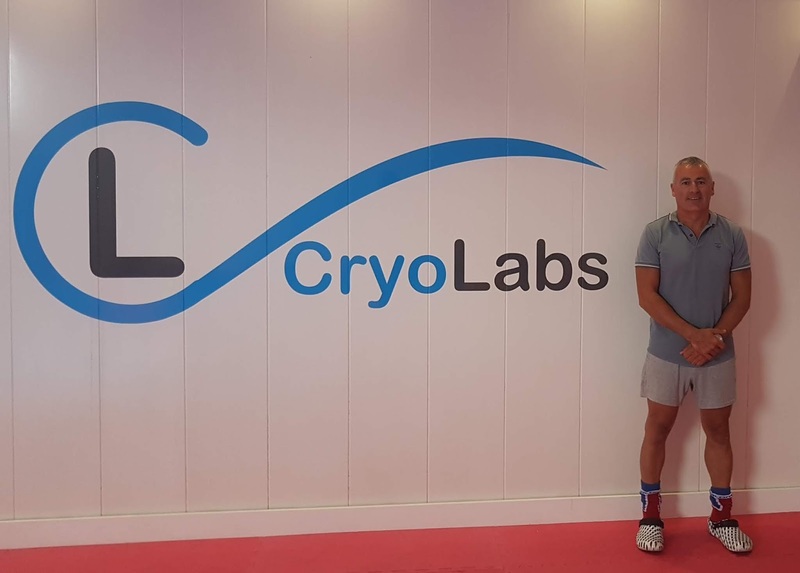 I caught up with founder Ian Watson to find out more about Cryotherapy & the new cool therapy everyone is talking about. 1. Hi Ian, & welcome to Country Bumpkin Chic. So, in a nutshell, what is cryotherapy? Cryotherapy is essentially the use of extremely cold temperatures to naturally treat a whole range of medical & other conditions. Cold therapies have been around since the times of the ancient Greeks & cryotherapy is the latest ramification of this. It could be viewed as a cold ice bath on steroids, but (due to it being a very dry cold) without any of the discomfort or ‘pain’ associated with immersion in ice cold water. 2. Why has cryotherapy become so popular? It’s used by the Premier League Football Clubs, as well as the Welsh & English Rugby Federations along with its adoption by many celebrity sports TV & other personalities have brought it into the public eye in the UK & the US. The fact that it’s very good for the skin (being used effectively to treat psoriasis, eczema, acne & post op scarring) is the reason the health & beauty sector has jumped on the bandwagon. 3. What made you set up the CryoLabs in Poole? I’d planned on my retirement from my technology investment business based in London, but knew I wouldn’t be able to sit still without looking to do something to occupy my time. So I was looking for something I could do locally without the constant travel associated with my investment business &I just happened to read about Leicester City FC being the first to adopt one of these cryotherapy chambers for their players. When I investigated further I was pretty shocked & interested to find that there was nowhere in the UK that members of the public could gain access to one of these professional clinical quality chambers. The optimum temperature for any sort of therapeutic benefit from Cryotherapy is -132C. The electrically cooled cryo saunas or the cryo pods (where you see the users head sticking out of the top of the pod) used by all of the other cryotherapy providers in the UK are not capable of operating anywhere near this beneficial temperature. The electrical cryo saunas tend to operate around -70 to -80C which will get you cold but won’t actually do you much therapeutic benefit. I felt if I was going to get into this new business sector I would do it properly from the outset & make the investment in a professional clinical quality chamber. As a result, Poole is the only location in the UK where members of the public can access such a chamber & feel the real benefits of cryotherapy. 4. What do you need to wear in the chamber? To get the most out of the session we advise men & women wear cotton shorts, a sports top or bikini with no underwire for ladies, bare chest for men. A face mask, headband, ski gloves, thick socks & clogs will be provided. & we advise that jewellery is removed. 5. What’s the split between people using it for sports injuries vs beauty? The split seems to be around 30% sports injuries, 60% other medical conditions and 10% beauty. I see room for strong growth in the beauty sector, but it’s a case of people understanding the benefits cryotherapy delivers for the skin & getting to know that we’re here. 6. What’s been the age of your oldest customer so far? Our oldest customer was actually my 84 year-old mother! She loved it & was surprised how quickly she warmed up after coming out of the chamber. She’d been worried that she might be shivering all day afterwards. 7. What’s the feedback been like from customers? The feedback has been fantastic & what’s been great is that it’s genuinely helped people with medical conditions they’ve been suffering from for ages. We’ve had great results with conditions like fibromyalgia, psoriasis & eczema & almost unbelievable results with clients recovering from major sports surgical operations. 8. How often do you personally use it? I must admit to jumping in most days after the last session! 9. How much do sessions cost? We also do voucher schemes on Facebook & other special offers open to existing customers on a weekly basis which usually provide a 50% discount on normal single session rates. 10. What’s the best way for people to find out more? People can check out our website at www.cryolabs.co.uk or look us up on Facebook or Instagram Or simply call us on 01202 611201. 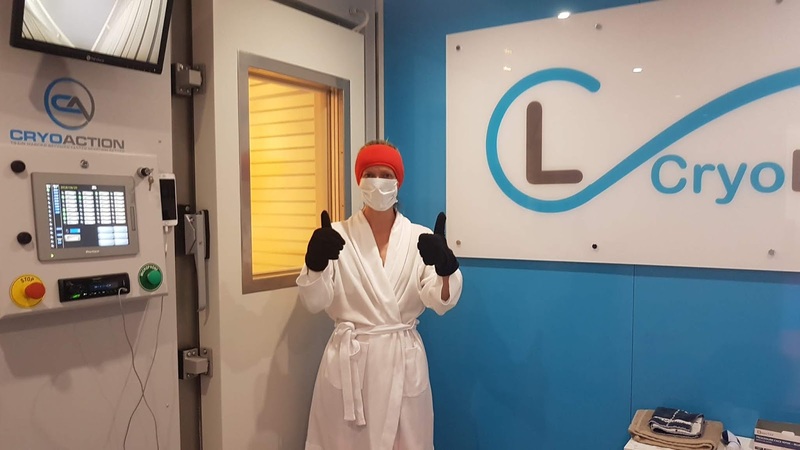 We’re always happy to help you understand what cryotherapy is & what the benefits could be for individuals depending on their reasons for wishing to try it. Thanks, Ian for your inside scoop on CryoLabs. We look forward to seeing you soon. All kitted out before I step into the chamber… oh & the dressing gown did come off, you don’t need to see me in a bikini! I attended CryoLabs twice during my rehab, & definitely noticed a difference in my mobility. Also, not that weight loss was the reason why I attended, but I lost a kilo 48 hours after I first attended & my Dad noticed the same. So, just putting it out there if anyone has any black tie events coming up & want to look super hot in that LBD or suit! If anyone has any questions on the CryoLabs please contact Ian or pop a question below in the comments box.